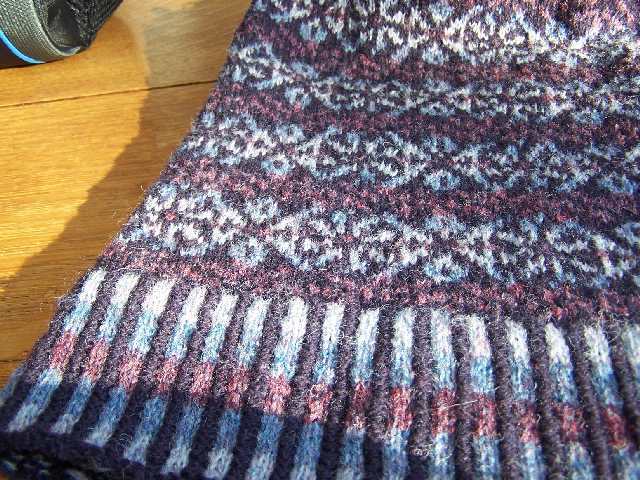 Progress on SFC Whirligig Vest continues. Met up with my friend Shirley today at our monthly book review club. We showed everyone our SFC vests. She is ready to steek and hope she will post a photo soon. 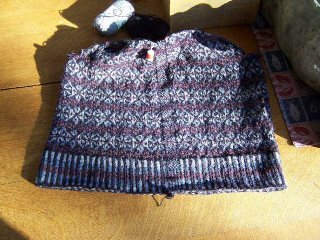 I'm about half way up the front decreasing the V neck and past the armhole decreases. The vest just will not photograph well but photos are attached. We're headed off end of March to a Knitting Weekend sponsored by Unique One knit shop in Camden, Maine. Maybe we'll be wearing our vests by then? btw I got your submission to the aran knitting ring, you have to post the ring code before I can approve you! Anne, your SFC Whirligig vest is really coming along. I love the colors and will be monitoring your progress. That is just lovely. I love the soft muted colors. Your knitting is wonderful!